What a sight! 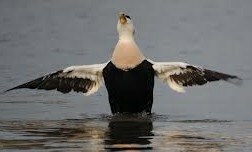 Common Eider frolicking. There were maybe 75 of these ducks. I figure they are making their way back north for the summer. This entry was posted in Life and tagged Common Eider, duck, ducks, East Coast, Migration. Bookmark the permalink.